Since the 1830s, historians have agreed that no European faced criminal prosecution for offences against the Indigenous people of Van Diemen's Land in the colony's Supreme Court. In the first decade of the twenty-first century, however, a counter-narrative has emerged, in which William Tibbs' conviction for the manslaughter of a 'black man' is read as a significant example of disinterested settler–indigenous legal relations. 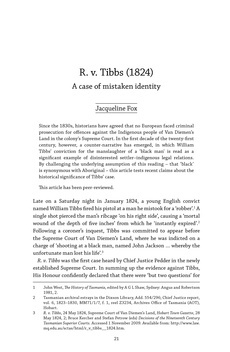 By challenging the underlying assumption of this reading – that 'black' is synonymous with Aboriginal – this article tests recent claims about the historical significance of Tibbs' case.